The Wenger Patagonian Expedition Race returns for its eighth edition next month, with the reigning champions taking on the biggest field in history on a course that will create the toughest and most southerly adventure race ever run. Last year’s event, won by British team, and newly crowned Adventure Race World Champions, Helly Hansen-Prunesco, proved its reputation as the wildest race in the world. American Team Calleva got lost and had to be rescued after surviving on berries for four days. The event is an annual adventure race which takes place in the southern-most region of the world. Top-ranked international teams compete in spectacularly rugged and climatically diverse terrain in the Chilean Patagonia region located between southern latitudes 49º and 56º. Extremely physically and mentally challenging, it tests competitors to the limit on bike, kayak and foot as they traverse plains, mountains, glaciers, native forests, swampland, rivers, lakes and channels, guided only by their mind and spirit and driven on by their physical stamina and experience. Past routes have incorporated the Southern Continental Ice Field, the Torres del Paine National Park, the Strait of Magellan, Tierra del Fuego, the Darwin Range, and the Beagle Channel. Race organizer Stjepan Pavicic said: “Every year we explore new areas of Chilean Patagonia to make the race as scenic, wild and unexplored as possible, always at the limit of the possible. “The historic average of teams crossing the finish line is below 50%, last year’s race edition it was as low as 30% – so this year is going to be interesting. 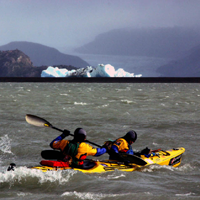 This year the event will mark Chile’s Bicentenary with 600km-plus of trekking, kayaking, climbing and cycling in the footsteps of explorers Ferdinand Magellan and Charles Darwin through the stunning Tierra del Fuego region of Chilean Patagonia. Team Helly Hansen-Prunesco will lead a 60-strong field of men and women that includes teams from 12 nations all battling for the pride of victory. The ‘Land of Fire’ will provide competitors with challenging terrain of white-capped mountains in the Darwin Range, freezing glacier-fed waters in the legendary Beagle Channel and unpredictable sinking moss, known as peatbog, widely found in Patagonia. Wenger, the event sponsors, was founded in 1893, in the famous Swiss Jura region and is best known as the maker of the genuine Swiss Army Knife. The race, which is supported by the Chilean government and is the only adventure race partnered with an Olympic Committee, will donate all funds generated beyond the operating budget to conservation projects in the region.